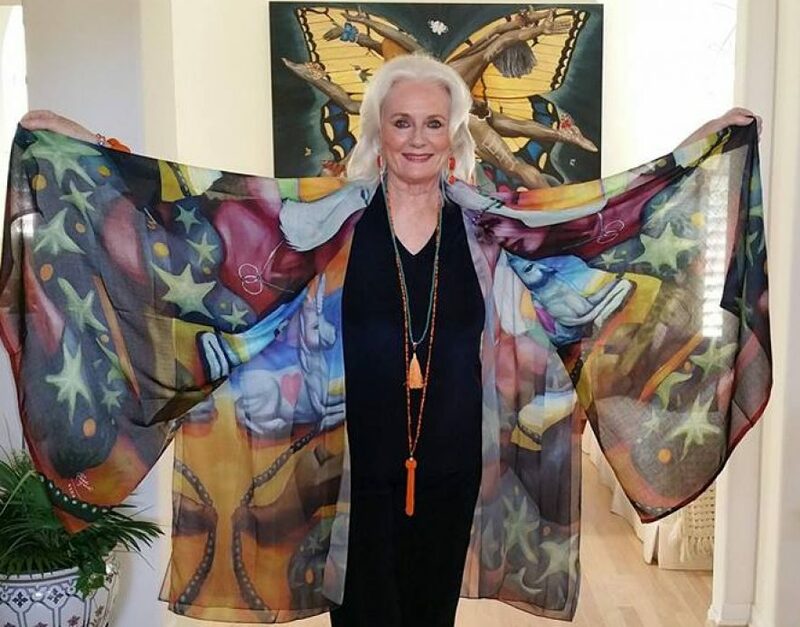 Here (below) I am wearing the Elation Sheer Wrap with the matching 100% Modal long scarf, which is how I like to wear them. When traveling in the middle east one can use the long Modal Scarf as a head wrap or a cute turban! Or just have that extra layer for when the AC is cranked up! If you wear it around your head you can even wear your hat, too to protect you from the hot sun of the day or by night it makes a beautiful shawl! Nazim is wearing the Ulysses Blue Butterfly (repeat pattern) Modal scarf which is available at his webshop. Nazim and I each have our own websites with VIDA to offer more art works. The photo was taken in Cairo, Egypt May 2017, at the Four Seasons, First Residence at Giza where we stayed and enjoyed high tea that day! The art work features the nazar boncuğu which is famous in the middle east as it is said to protect those who wear it or keep it near them from the Evil Eye. I don’t know if it works or not as I am not a superstitious person, but I do love the colors!